An accidental stumble into a video posted by Wilhelmsen to their Facebook page about the port of BREMERHAVEN prompted me to revisit this 2013 “classic”. Why was I tracking Wilhelmsen’s page? Well, I worked in Wilhelmsen (MY) for a couple of years as their PMO consultant on one of their projects, and still have good friends working there. p/s I know I’ve been missing from updating this blog as I’ve been super busy on other parts of my life (and work), and for the past couple years have hardly been able to find time to write. There was never short of contents. Our Fri meetups are still happening regularly; it’s just my own struggle to find time amidst all the hustle bustle of life to sit down and write. Things are still pretty busy – and backlogs are still piling up – but hopefully I can continue writing albeit at a “simpler” context. BREMERHAVEN is a 2013 title from Lookout, and it plays best with 3-4. We picked up this title from Essen but it went “missing” after that and at this moment, it’s ranked #2984 in Boardgamegeek (what?). My last play was probably back in 2013 – and TBH I can’t remember much of that session. I just think this game can’t be that bad… so the Wilhelmsen Bremerhaven video looked like a hint to say we should revisit this. (From left) William, Dennis and Kareem joining me for this 4p session. At the back table, that’s NOTRE DAME in session. 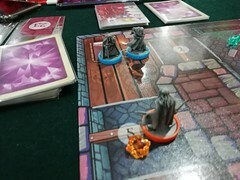 I’m not going to delve too much into a review write-up nor about the rules/gameplay but merely do a short recap about our session and how I feel about this game. 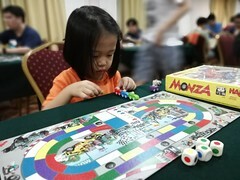 Is it an underrated game or is it a game as “bad” as it’s current #2984 ranking in Boardgamegeek? The THREE boards where bidding for worker placement happens. From top – Town board, Sea board, and Land board. There are three areas (or boards) where you use blind-bidding (via a set of 5 bidding cards) to do your worker placement. The top board (in pic below) is the Town Board where you get to do most of the key actions such as acquire building, obtain a special building, upgrade your bidding privilege (ie increase the strength of your bidding cards), market price manipulation and turn order change. 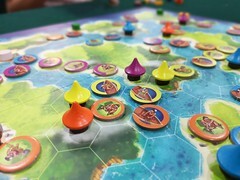 The other two boards – Sea and Land (below) – provides you with Ships (which provide resources) and Contracts (requiring resources to fulfill). That’s essentially the gist of the game. Yes turn order is important in this game. But first-in-turn is not necessarily good (or bad, haha). You really need to watch what your other opponents are doing. You want to avoid competing with too many people for the same “thing” and at the same time want to catch the opportunity to throw a spanner in your opponent’s plan by outbidding him on an action he badly needs. 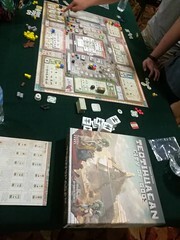 One thing most of us learnt in this session is the importance of the time markers (the clock icons in the top left of the ship and contract cards). Each ship and contract comes with its own time markers which indicate how long (as in how many turns) the ship and contract will stay in your harbour. Pay attention to these time markers as they can mess up your plans pretty badly if they are not managed properly. tsk tsk. You also have your own Harbor board – you ain’t much of a harbormaster if you do not even have your own “harbor” to manage, no? All the special buildings, ships and contracts you acquire are placed here. There are some (minor) logistic issues you have to deal with here but nothing that may give you sleepless nights compared to what the other 3 fellas are scheming. How did we find the game? All of us came out with positive reviews of the game. 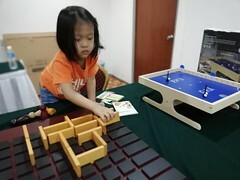 This is a game that favors aggression (in the bidding stage). Sure, you can play “cooperatively” since there are enough spaces to skirt around and avoid confrontational bid. But why? In our session, William aggresively closed out the Upgrade Bidding Privilege action; so much so that he was the only one able to upgrade his bidding cards to high value ones in the first few rounds of the game. Given bidding is the key element to this game, this can be a crucial blocking move. A few of us also threw in some high bids on the Building Permit action… denying others of cheap builds. This partly explains why we didn’t have many special buildings in our harbor (but that’s also due to us not understanding the value of special buildings). There was a turn early in the game where three of us have contracts to fulfill – that’s when you sell the goods on your contract for profit (money converts to VP at the end of the game). There was a fight for the Price Control action. Kaz lost that bid and I think that loss cost him $18+ in lost profits. If he was able to reduce that loss by half, he could have won the game – that’s how tight the margin was. The scores at the end were tight. William won but it was really a close margin. Anyone of us were just one prestige or a few dollars away from him. Basically there was still everything to fight for in the last round. I am glad the accidental post of a video by Wilhelmsen led us to give this underrated classic a revisit. Would certainly love to play this again if it ever gets the chance to hit the OTK tables. Perhaps we could do a Shipping or Port/Harbor theme nite? 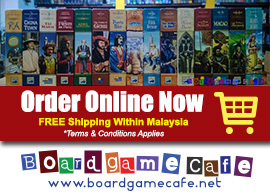 Games that would fit into a SHIPPING or PORT/HARBOR gaming theme night. What’s your favorite? Playing BREMERHAVEN has whetted our appetite for more cutthroat sessions with this same group. 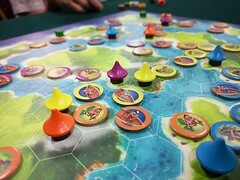 Our initial thoughts went to WEST OF AFRICA, a recent Euro from Spielworxx. In West of Africa, guessing your opponents’ intentions is not about gaining some bonus, it is more often a matter of survival, of being able to do anything at all. But as I write this post, my mind wanders to another game that has perhaps also got lost without much buzz. It’s a much older game (circa 1999). My copy is the German edition – they didn’t even have an English edition back then. Z-man has reprinted it in 2009 as Merchants of the Middle Ages but apparently they’ve also nerfed one of the rules that made this game interesting (player abilities). You can be sure if this gets on OTK tables, we’ll certainly be playing with the original German rules. After all, ours is the German 1999 edition. We also like to call this game by it’s original German name – DIE HANDLER.